Next post: Got our wedding rings! Yesterday was a brutal day at work, and I didn’t get home until 8pm.Â Still, I managed to sneak some tapestry weaving and a little dyeing in – not enough to be worth showing, though. 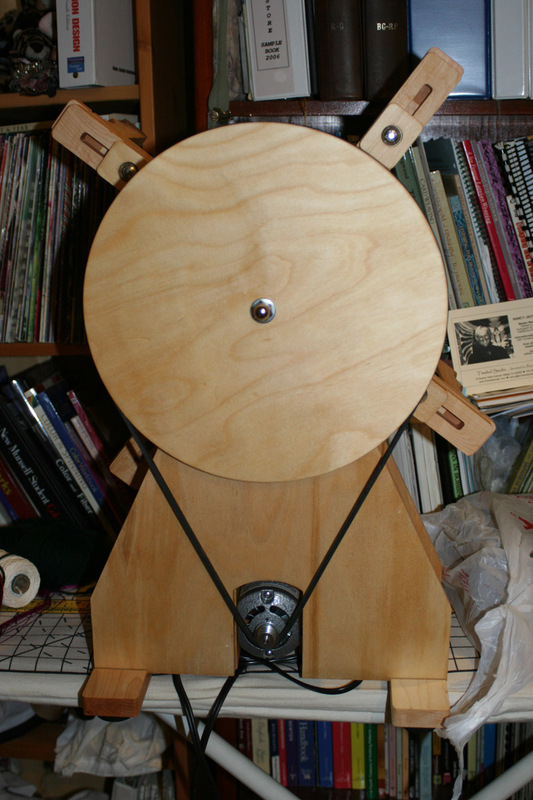 AND…my new toy arrived and I put it together!! 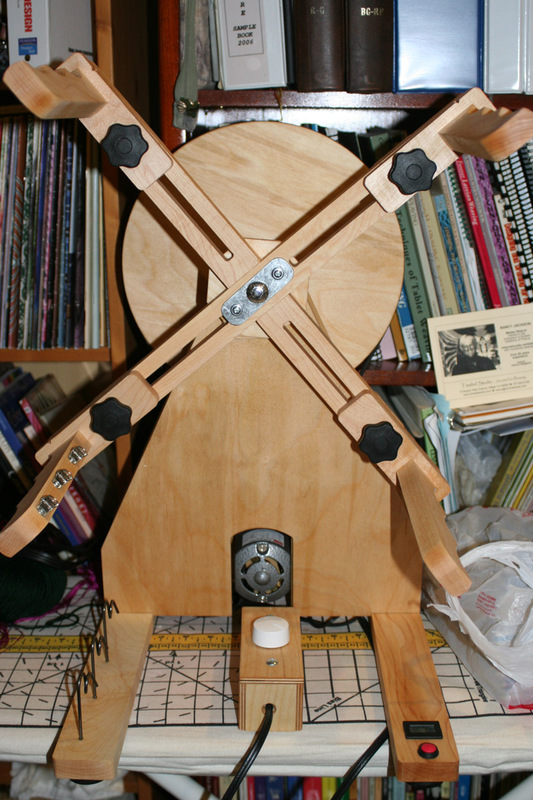 Yes, my new Crazy Monkey electric skeinwinder came in today’s post.Â I put it together, and it is a total dream.Â The speed goes anywhere from extremely slow to can’t-see-the-skein-arms fast, controlled by a rheostat attached on a wire (so you can hold it in your hand).Â And it is SILENT! !Â The counter is magnetic, resets easily.Â Assembly was fast and the instructions were very clear.Â (I did have one problem with a too-thick washer, but I popped in a thinner washer from my toolbox and it worked just fine. )Â It’s got space for three skeins on the arms (and has three guide loops at the bottom to make sure the yarn stays in the three spaces), so you can wind three skeins at once.Â And it fits into a corner of my studio closet. As you can see, the motor at the bottom turns the small shaft at the bottom, and the V-belt translates it to the big wheel at top, which in turn drives the skeiner.Â I’m not quite sure why such a big wheel is necessary – perhapsÂ to slow down the max speed of the swift?Â It does work VERY fast, so it may need the slowdown.Â A larger wheel also adds friction to prevent the belt from slipping. At any rate, I’m extremely happy with my new toy, and can’t WAIT to use it! No fibery stuff tonight…I’m going to the EAGLES CONCERT! !Â I’m a total fan of the Eagles, and this may well be their last tour (they’re all pushing 60, if they haven’t reached it yet), so I’m really excited about having scored tickets.Â It’s their “Long Road out of Eden” tour, and I’m psyched about hearing new material.Â I’ve been looking forward to it for months. Hope you enjoy the concert – I bought their Long Road cd some time ago and love it, great music! I have been eagerly waiting for your test run on this. I know you’re doing fine silk, so I am hoping that winding wool skeins will work as well.